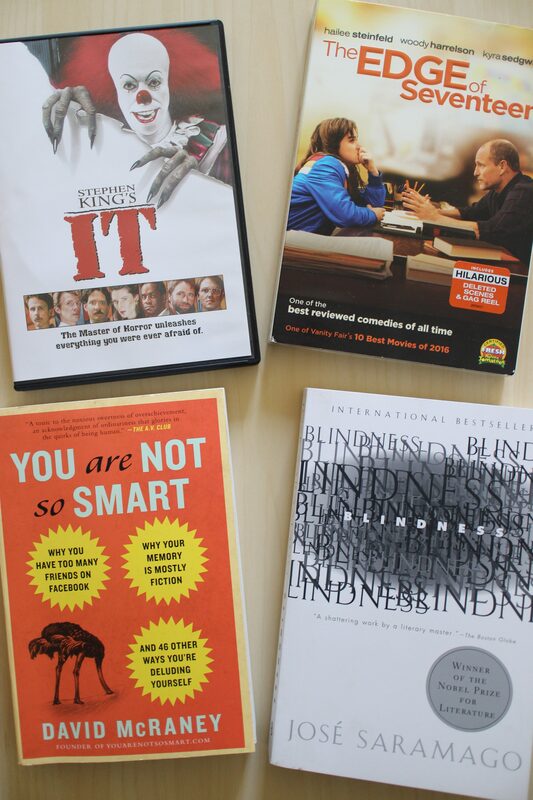 My Birthday Book & Movie Haul | Finding delight. In case you can’t tell by the title of this post, I recently had a birthday! Just last week, in fact. I was blessed with some amazing gifts (like this beautiful bar cart from Chet and a huge box of Gilmore Girls themed coffee from my mom!). Who doesn’t love watching a scary movie (or three or four) in October? I still really want to see the new version but I mean c’mon! So many famous faces in this one. Including, but not limited to, John-Boy from The Waltons sporting a rad early 90’s ponytail. This movie looked reminiscent of two of my favorite coming-of-age flicks – Cheaters and Juno…and the back cover likens it to a modern day The Breakfast Club (another fave!) – so I was all in. Plus, I love Woody Harrelson! Since I left the world of speech & debate, and no longer sit through tons of informative speeches every weekend, my annual dose of pop psychology has drastically diminished. This looked like an interesting and fun way to rectify the situation. I’m excited to dig in! Saramago was awarded the Nobel Prize for Literature in 1998 so this book seemed like a good bet. 😉 The subject matter, a city hit by an epidemic of “white blindness,” reminded me a little bit of Station Eleven. Not to mention it won a ton of awards and received rave reviews! So, although it’s not a book I would normally gravitate to, I couldn’t resist. Which of these interests you most? Have you bought any books or movies for yourself lately? I’d love to hear! Scary books and movies are perfect in October, but I’m a chicken, I skip those haha. Halloween also… not a big fan. Just too scary – whoops! I’d love to read that ”you’re not so smart” book! Sounds like a book for me, I’m always questioning everything haha. I feel like blindness would be a book I wouldn’t be a ble to put down. Stephen King is a horror God so you can never go wrong with a class SK film/book! I want all of your books! Especially. the last one which i don’t know how i haven’t read it yet! It looks absolutely terrifying, as someone who’s afraid of clowns haha. These are so on theme with October though! Thanks for sharing! I’m terrified of clowns, too!!! Although the 90’s campiness in this version makes it a lot less scary than I imagine the new one is. I’ve watched The Edge Of 17 and really liked it! It’s such a good comedy and I love Woody Harrelson. A friend also recommended Blindness to me, but I didn’t have time to read it yet. Looking forward to your review and opinion on the book! Another book (or rather series) I’d love to read is Outlander.